From Ganesh to Sai Baba, from Krishna to Ram...VedSutra is the place to find any and all information about Hinduism, Hindu Gods and Hindu History. Karva Chauth is a one-day festival celebrated by married Hindu women. It is marked by a strict fast wherein no food or water is consumed for the large part of the day. This article on Karva Chauth Vrat Vidhi lists all items required for the pooja(i.e. Karva Chauth Samagri) as well as the step-by-step process to conduct the various rituals during the day. In additions answers to common questions are also covered. If you have any questions about the process or history of Karva Chauth, do mention it in the comments at the bottom of this page. You can also visit our detailed article on Karva Chauth for other info and resources about the festival. Decorated Karva (Mud pot with an outlet to the side) – 1 Karva if you plan to do the puja in a group, 2 Karvas if you are doing the puja alone. One day before the day of Karva Chauth, take a head-bath. Following that apply mehndi in your hands and alta on your legs. You are free to choose from a wide variety of Mehndi Designs and Alta Designs. It can be simple or highly decorative based on your preferences. This is also the day to prepare ‘sargi’. Sargi, also known as Sargahi, is the food that is consumed by fasting women on the day of Karva Chauth early in the morning before sunrise. Typically, the mother-in-law must prepare the ‘sargi’ and give it as an offering to the married woman. Originally ‘Sargi’ referred to a vermicelli pudding. However, in modern times, this offering consists of both food (like fruits, sweets, puris, kachoris etc.) & cosmetic items (like sindoor, jewelry, a red saree etc.). If you are doing the Karva Chauth vrat alone, you can prepare the sargi yourself at home. You should also ensure that you purchase all the required ‘Karva Chauth Samagri’ i.e. items required to conduct the Karva Chauth Puja, on or before this day. Note that while Sargi can contain a wide variety of food items like fruits, sweets, milk, seviyaan, puri and kachoris, onion and garlic should not be used as ingredients in any of the items. More than anything else, remind yourself to maintain a positive, calm and happy frame of mind during the day of Karva Chauth. Remember that it will easier to successfully complete the tough fast if you are feeling positive through the day. As and when you find time during the day keep thoughts of Goddess Parvati, Lord Shiva, Lord Ganesh and Lord Kartikeya in your mind. Remember that this is only to ensure that you stay positive during the day and is not a strict requirement. On the day of Karva Chauth, wake up 2-3 hours before sunrise (typically around 3.30-4 am). After finishing your morning routine, have ‘Sargi’ as breakfast before the sun rises. Drink as much water as you can during this period. The fasting phase begins with sunrise. Remember that Sargi can contain a wide variety of prepared and ready-made food items like milk, fruits, seviyaan, sweets of different varieties etc. However, ensure that you do not eat anything that contains onion or garlic as ingredients. Having taken bath and consumed the Sargi, dress yourself in traditional-wear which is representative of your married status. This typically includes a red or rose-colored saree and traditional cosmetics like Sindoor (Vermillion powder), mehndi (henna) on your hands , red bangles, alta (red dye) on your legs, bichua (toe ring) and payal (Indian anklet) etc. Note that red colored sarees are usually preferred by most women but rose-colored sarees can also be worn. Many women prefer to wear the clothes that they had used on their wedding day as Karva Chauth’s primary focus is to celebrate the holy bond of marriage. After this, you should spend some time making rangoli outside the door of your house. You are free to use rangoli making instruments as needed. Once again, this is a flexible rule and you can make the rangoli in your backyard or even the inner area of your house near the door depending on space constraints. You are free to choose any rangoli design based on your preferences and constraints. Around 4 pm in the afternoon, cordon a small square area (40 cm x 40 cm should be sufficient) next to a vertical wall inside or outside your house. Clean the area with water. In the middle of the area make a Swastik mark with wetted Turmeric. Against the vertical wall, place the Karva Chauth Calendar (i.e. image of Karva Chauth). The Karva Chauth Calendar contains representations of Goddess Parvati, Lord Shiva, Lord Kartik and Lord Ganesha as well as the representation of the Karva Chauth Katha/Story. This is the image which is worshiped during the following ritual. In the area before the image, place a small bowl with raw rice grains. In a plate place other puja items – rouli (red chandan), mouli (sacred thread), haldi powder (turmeric powder), a glass of clean water or a glass of milk, a clean betel leaf and a betel nut. Place the karva in the center of the Swastik mark that you had made and fill it with water or milk. You should also stuff the outlet on the side of the Karva with cotton to prevent the liquid from spilling out. In addition, you can also insert currency coins, coins made of precious metals or precious stones into the Karva. Note that the Karva has to be donated after this puja, so decide accordingly. Now close the top of the Karva with its cover and over the cover place grains of wheat and sugar. Instead of sugar you can also place 14 Maal-puas on it. Now apply the rouli (red chandan) to the Karva and then tie the mouli (sacred thread) around its neck. If you are doing the puja alone, prepare another Karva following steps 5 to 6 as above. Place this second Karva next to the image of Karva Chauth. Symbolically, this Karva belongs to Goddess Parvati. Now dip the Mango leaves into the glass of water/milk and use it to sprinkle some of the liquid onto the image of Karva Chauth. Now apply rouli (i.e. red chandan) to the images of Gods on the Karva Chauth calendar. Then mix a small amount of haldi (turmeric) and akshat (raw rice grains) and sprinkle it on the image with your fingers. You should now place the betel leaf before the image and on the top of it, place the betel nut. You can also light a dhoop-batti or agar-batti and place it next to the image as you do the puja. In addition, if you have a small garland of flowers you can adorn the image of Karva Chauth with it. The pooja ritual is now complete. The next step is to do a recitation of the story of Karva Chauth, also known as ‘Karva Chauth Katha’. Note that some sources describe only one story while some others describe multiple stories one after another. These stories can be read in any language of your choice. While reading or listening to the story, you should hold some raw rice grains in your fists. When each story is completed, loosen your fist and place the rice grains into the pallu of your saree. Then take another fistful of rice as the next story is recited. When the story-telling session is completed, keep both the karvas aside and donate them to a near-by temple. Similarly the rice grains used during the ritual should also be donated to the temple. Alternatively, you can gift the karva along with other items like cosmetics, fruits, sweets and food preparations to an older married woman in your neighborhood. After this puja, touch the feet of all elders in the family to seek their blessings. Around 4 pm in the afternoon, cordon a small circular or square area inside or outside your house. Clean the area with water. In the middle of the area make a Swastik mark with wetted Turmeric. You can also place a small puja table here instead. The women in the group should sit in a circle around this area. Place the Karva Chauth image at the center of the circle. 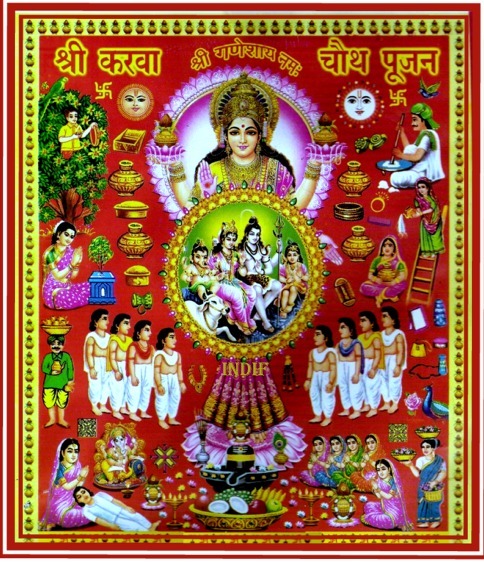 The Karva Chauth image contains representations of Goddess Parvati, Lord Shiva, Lord Kartik and Lord Ganesha as well as a representation of the Karva Chauth Katha/Story. This is the image which is worshiped during the following ritual. Next to the image you can place food offerings like fruits and prepared desserts if required. Steps 4-11 must be done separately by each woman in the group. In a plate place hold all puja items – a small bowl of raw rice grains, rouli (red chandan), mouli (sacred thread), haldi powder (turmeric powder), a glass of clean water or a glass of milk, a clean betel leaf and a betel nut. Place the karva before you and fill it with water or milk. You should also stuff the outlet on the side of the Karva with cotton to prevent the liquid from spilling out. In addition, you can also insert currency coins, coins made of precious metals or precious stones into the Karva. Note that the Karva has to be donated after this puja, so decide accordingly. Now apply rouli (i.e. red chandan) to the images of Gods on the Karva Chauth calendar. Then mix a small amount of haldi (turmeric) and akshat (rice) and sprinkle it on the image with your fingers. You should now place the betel leaf next to the image and on the top of the leaf place the betel nut. You can also light a dhoop-batti or agar-batti and place it before to the image as you do the puja. In addition, if you have a small garland of flowers you can adorn the image of Karva Chauth with it. The pooja ritual is now complete. The next step is to do a recitation of the story of Karva Chauth, also known as ‘Karva Chauth Katha’. Ideally the oldest woman in the group should recite this story. Note that some sources describe only one story while some others describe multiple stories one after another. When the story-telling session is completed, keep both the karvas aside and donate them to a near-by temple. Similarly the rice grains used during the ritual should also be donated to the temple. As an alternative, you can also gift the karva along with other gifts like cosmetics, fruits, sweets and other food preparations to one of the older women in the group. After this puja, touch the feet of all elders in the group and your family to seek their blessings. In the evening, you can change into a different set of traditional clothes (once again red/rose-colored saree is preferred) and re-apply traditional and modern cosmetics if needed. Once the Moon rises in the sky, light the diya (mud lamp) on the plate and go to a place from where you have a direct view of the Moon. Make sure you take all the pooja items you had gathered in the previous step for this ritual. Note that your husband should accompany you during this ritual. In case he is not available you can also contact him over the phone while conducting the ritual. Worship the Moon God by making symbolic offerings of different pooja items. First worship the Moon with the plate that has a lit diya on it as well as other pooja items. You can show the diya to the Moon by moving the plate in a circular motion around the image of the Moon. Pick-up a small amount of the akshat and turmeric with your fingers and sprinkle them in the direction of the Moon. Then offer the pot of water to the Moon. For this, hold the pot in the direction of the Moon and pour some of the water into the ground before you. Ensure that you leave some water in the pot as you will need it to break your fast. Finally, close your eyes and pray to the Moon asking for whatever it is that you wish for. Now through the circular sieve look at the Moon and then at your husband. You can also balance the diya on the lower rim of the seive as you do this but it is not necessary as you have already used it during the puja of the Moon earlier. The Karva Chauth rituals are now complete. You can now enjoy a sumptuous meal with your family. The husband and wife can also exchange gifts at this points. What is the meaning of ‘Karva’? Karva is a Sanskrit term for a pot made with mud. In the context of Karva Chauth it refers to the mud-pot which has a long mouth just like a kettle. In addition, Karvas come with a lid for the opening on the top which is also made of mud. One key difference from a kettle is that Karvas do not have a handle. Karvas are frequently sold in the market with a lot of additional decoration. How many Karvas are required during the puja of Karva Chauth? As outlined in the Karva Chauth Vrat Vidhi, you can do all the rituals with 1 or 2 Karvas depending on whether you are doing the fast in a group or alone. However, there are many regional variations in the Karva Chauth Vrat Vidhi and in some places women observing the fast organize as many as ten karvas individually, each filled with a different preparation from milk to a wide variety of desserts. This is, however, not a necessity and you should not feel any anxiety or doubt about the effectiveness of Karva Chauth just because you are using a lesser number of karvas. At the end of the day, the success of the fast is determined by the devotion with which you do it. How do I do the Karva Chauth rituals if I am not able to buy a ‘Karva’? In case you are unable to procure a traditional Karva made of mud, you can use a karva made out of metal. Alternatively, you can use a small pot or even a normal glass which can serve the same function. If required, you can separately obtain a cover for the pot or glass that you are using. Karva Chauth Vrat Vidhi is flexible on this front as long as you are willing to do the puja with pure devotion. Sargi or Sargahi traditionally referred to the breakfast that women observing Karva Chauth had before sunrise. It originally was the name of a kheer (rice pudding) made by the mother-in-law as a gift to her daughter-in-law. However, as the rituals of Karva Chauth have evolved over time, Sargi has come to refer to the entire set of gifts (including food, clothes and cosmetics) used by women on the day of Karva Chauth before sunrise. The only restriction is that sargi should not contain any non-vegetarian items and similarly onion and garlic should not be used as ingredients in any of its food preparations. Consumption of the Sargi is the first step in Karva Chauth Vrat Vidhi. Having nutritious food as part of the Sargi will make it easy for you to complete the strict fast. What is Baya or Bayna? Towards the end of the day of Karva Chauth, fasting women typically hand over their karvas to their mother-in-law or to an older woman in their family or neighborhood. Along with the karva, gifts like cosmetics, fruits, sweets and other food preparations are also included. This entire set of items is referred to as Baya or Bayna. As part of the Karva Chauth Vrat Vidhi, Baya or Bayna can also be donated to a nearby temple instead of an older woman. What should I do with the Karva at the end of the Karva Chauth rituals? The traditional practice is to give the karva along with other gift items like cosmetics and food to your mother-in-law. Alternatively, you can give it to any other older married woman within or outside your family. In case these options are not available to you, you can also donate the karva to a temple near your house. What type of clothes should one wear on Karva Chauth? Is it necessary to wear new clothes? It is not necessary to wear brand new clothes on Karva Chauth. However, as you will be engaging in religious rituals, ensure that you wear clean clothes during the day. Traditional wear is usually preferred with red or rose-colored sarees used most often. Depending on personal preferences you can also go with sarees of other colors. The only reason behind a preference for traditional wear is that it is believed to represent the married status of the fasting woman. An important thing to note is that you should avoid wearing clothes with shades of black or white on them. How do I exchange my Karva when I am doing the Karva Chauth rituals alone at home? As described in the Karva Chauth Vrat Vidhi above, you should procure two karvas for the rituals in case you are observing Karva Chauth alone. Both the karvas have to prepared in a similar manner and while doing the pooja, you place one Karva next to the image of Goddess Parvati (who is also represented in the ‘Karva Chauth Calendar’). Symbolically, this karva belongs to Goddess Parvati who is believed to have observed Karva Chauth for the well-being of Lord Shiva and her family in ancient times. Then as the ritual comes to a close, you can exchange your karva with the karva of Maa Parvati seven times while chanting the words mentioned earlier. Alternatively, in case you procured only karva for the puja, you can just rotate your karva around the image of Goddess Parvati seven times. Does Karva Chauth strictly require one to go without drinking water for the duration of the fast? What do I do if I am not able to do the Karva Chauth fast due to health or other reasons? According to ancient scriptures, observers of Karva Chauth have normally preferred to strictly avoid both food and liquids for the duration of the fast. However, Karva Chauth Vrat Vidhi has evolved to adjust to modern lifestyles with added flexibility. A lot of women today work in corporate environments and it can become very difficult to hold the fast during a workday. A common alternative in such situations is to consume only fruits and fruit juices during the fast. Some groups believe that the rules which you adhere to on your first Karva Chauth should remain constant through your lifetime. Besides this, if you are pregnant or suffering from any health conditions, it is highly recommended to consult a doctor to decide if it is safe for you to keep the fast. In case you are not able to keep the fast, you should still observe the evening ritual of Karva Chauth with your husband and while doing so ask for forgiveness for your inability to keep the fast. Remember that your health and well-being comes first and you should ensure your safety before engaging in strict religious rituals laid out by Karva Chauth Vrat Vidhi. How do I break the Karva Chauth fast if I am not able to see the Moon due to weather conditions or other reasons? It is believed that the Moon seen in the sky on the day of Karva Chauth is an incarnation of Lord Shiva. As a result if you are not able to see the Moon due to weather conditions, you can follow an alternative ritual to break the Karva Chauth fast. However, you should ideally wait for up to 1 hour after the Moon-rise time in your respective city before going ahead with the alternative ritual. This alternative ritual replaces the moon in the sky with an image of Lord Shiva who is often represented with a moon crescent on his head. You can use a printed photograph of Lord Shiva or even just find an image on a digital device. To break the fast, watch the moon crescent on Lord Shiva’s head through a sieve and then see your husband through the same sieve. Then process with the remaining rituals normally. What is the significance of watching the Moon through the sieve on the occasion of Karva Chauth? There are multiple interpretations attached to this ritual. According to one theory, this ritual is a way of projecting the Moon’s eternal lifecycle onto your spouse. Symbolically, you are praying to God that just like the Moon has an infinitely long lifetime, your spouse may also be blessed with similar longevity. Another interpretation identifies the Moon as a representation of Lord Shiva. According to ancient Hindu culture, married women typically do not look directly at their elders unless they have a cloth (typically the pallu of their saree) covering their hair. Looking at the Moon of Karva Chauth is symbolically similar to looking at Lord Shiva directly. Hence, it is believed that watching the moon through the sieve serves as a mark of respect to Lord Shiva – the Mahadev and the Lord of Destruction. In such a case you should make your own sargi. Today, it is a common practice for women to make sargi for themselves as many stay away from their mothers-in-law in different cities. However, please ensure that you do not use onion, garlic or non-vegetarian ingredients in any of the sargi recipes that you make. You can skip the Karva Chauth fast this year as you have valid health reasons for the same. It is absolutely okay to do that. 1) Sometime during the day, pray before an image of Goddess Parvati. Seek Her forgiveness for not being able to keep the Karva Chauth fast due to health reasons. Ask for Her blessings and protection for yourself and your family. 2) In the evening, carry out the Moon ritual normally. Even though you are not breaking a fast this year, you should still worship the Moon requesting for the longevity of your spouse and well-being of your family. Very informative article! Quite useful for people looking for step by step guide on karva chauth vrat vidhi. Thanks Ankit! I hope we were able to help members in your family who are planning to do the Karva Chauth fast and rituals this year. Hello…its a very useful article. And that will help me a lot for my first karva chauth. I have a question… Can you please tell me what will I do with the rice after putting it in my ‘palu’ after each story?? You can do two things with this rice after the ritual. Firstly store it in a bag or vessel at the end of the ritual. After that you can either give it to an older married woman in your neighborhood or you can just donate it to a temple near your house. Can you please tell me what to do with the water in the karva after the vrat? You can keep the water aside for use during the evening puja of the Moon. Another option is that you can just drain the water in a clean place like the roots of a plant/tree near your house. In this case, you can use fresh water for the evening puja. One more thing can you please tell me if it is important or compulsory to tie yellow or red thread around a tree (pipal or bal) ??? That ritual is not done on Karva Chauth. It is a part of some other Hindu festivals but is not a part of Karva Chath. 1) Whenever possible during the day, she must pray before an image of Goddess Parvati and seek Her forgiveness for not being able to keep the Karva Chauth fast due to health reasons. She can also ask for Maa Parvati’s blessings and protection for your family. 2) In the evening, if your wife is feeling better she should still carry out the Moon ritual normally. Even though she will not breaking a fast this year, she should still worship the Moon requesting for the well-being of your relationship and your family. The prayer that I suppose to start at 4pm. Can I start it now. Because I have already applied henna and Alta and all. It is normally preferred to do the puja of Karva Chauth in the late afternoon. We would recommend that you do it after 3.30 pm but before sunset. However, if you have other constraints like work etc. you can also do the puja earlier as well. Please tell me both karwa given on temple after listen katha or one given. Both karwas have to be given away. Symbolically, the second karwa belongs to Maa Parvati but you have to take care of handing it over to an older married woman or to a temple. Hello ,What to do with the milk in two karvas which I vl donate to an elder lady or to a temple? As I m unmarried and alone performing the ritual,two karvas I would take to perform this,so should I donate both the karvas to the same lady along with suhagi? Also tell ,when will we perform the ritual ? At 4pm or as per the muhurat scheduled for it? Both karvas have to be donated. You can pour the milk aside and use it during the evening puja of the Moon during which you can simply pour it entirely into the ground as an offering to the Moon. You can use water in a different pot to break your fast during the evening ritual. Another option is that you can also dispose the milk in the karvas in a clean place like the root of a tree or plant near your house. It is preferable to perform the Maa Parvati puja and reading of Karva Chauth in the late afternoon. We would recommend something after 3.30 pm but it has to be before sunset. There is no specific muhurat timing for the same. If we don’t get a beetle leaf and mango leaf then what is the alternate? You can do the pooja without the betel leaf. It is not a necessity. Just follow the rest of the process normally. If you are not able to find a Mango leaf, you can use a flower or even a clean spoon to sprinkle water over the Karva Chauth image. Hii…It’s my first fast….so can I consume food at the night after finished this workship or tomorrow I have to take it…. Hi Priya, You can consume food and water after you have done the Moon ritual and have broken your fast. Please read through the last section of the article above for details. One more question I want to ask is ..there is puja muhurat mentioned in the net for krvachauth which is after sunset timeperiod but pooja has to be done before sunset,why so much contradiction? Hello. I have already did my pooja. I have a big lamp (Diya) the picture of shiv parivaar. Should I use the same lamp (Diya) at night to do the pooja of the moon or I have to use another lamp (Diya) to do the prayer. Hi Eishwarya, You should use a fresh mud lamp/diya at night if you have one. If you are using a metallic diya, you can use the same one again. Ok..and what should I do with the Diya after that? You can clean and store them for reuse during Diwali if you wish. If you want to dispose them you can throw them in a clean area like the root of a tree or plant just like you would after Diwali. Hello. Can you please tell me when the moon will appear at night..so will I have to see the moon first in my pallu or do the prayer as mention, ??? Hi Priya, You can consume food or water only after the puja of the Moon and not before that. Your fast must be broken by your husband. For that, he must give you water from a small glass/container used during the Moon ritual. Please read the last part of the article above for specific steps to follow. Just to add. You can consume any type of food after this ritual. Just make sure that it doe snot have onion, garlic or any non-vegetarian ingredients. He can break your fast with water and any one food item that is on the puja thali. Hi Eishwarya, The moon rise time varies by city. You can find the time through an easy internet search. To break your fast, follow the procedure described in the article. In case you are not able to see the Moon due to cloudy weather, you can break your Karva Chauth fast using an image of Lord Shiva as described in one of the answers above. I have already seen the moon. Feeling blessed. Want to thank you for all your help. That’s really helped me to keep my fasts. Glad to hear, Eishwarya. You’re welcome. 🙂 Do join our WhatsApp Channel if you wish to receive updates from us on a regular basis. My mother skiped to give water to moon and had drank water and broke her fast but she realized and later she gave water to the moon, so is it bad and if yes so now what could she do to correct it. Such small errors happen quite often and should not be a big source of worry. However, your mother should pray before an image of Goddess Parvati and seek Her forgiveness for any mistakes that might have been made in following the rules of Karva Chauth. She can further pray for the well-being of her spouse and family. That should suffice to seek Maa Parvati’s protection and forgiveness. would like to see more details about this topic. I’m going to keep coming back here. Hii, can I do karva chouth vrat before marriage, if yes so can I do fast without sargi ? I wanted to do it for best life partner so can I open fast without seeing someone ?? Or what I hv to skip my food at that day to finish my vrat ?? Hi Sonal, Thanks for writing to us. Answering your question regarding Karva Chauth below. Yes, you can do Karva Chauth before marriage as well. You can do the fast without sargi if you want. Another option is to receive the sargi from your mother, sister-in-law (brother’s wife) or any other married woman near your house. Regarding open the fast – yes, you can open the fast without seeing someone. Just see the moon, make a wish and then end the fast. Other rules regarding not consuming food or water till the fast is broken remain the same. Feel free to write to us if you have any other questions. I m unmarried and want to do all rituals….as like a married women ..as I love my future husband so much ….so how I can ….taking fast in the absence of …my bf ……and how I can open my fast…I really love him …and want to take fast ..for his great and long life …..
Hi Sakshi, Thanks for writing to us. Yes, you can do Karva Chauth before marriage as well. Instead of looking at the face of your partner you can simply think of him in your mind instead. For opening the fast, you can either receive the sargi from your mother, sister-in-law (brother’s wife) or any other married woman in your neighborhood. Regarding opening the fast – Just see the moon, think of your partner with your eyes closed, and then end the fast. Other rules regarding not consuming food or water till the fast is broken remain the same. When the story-telling session is completed, keep both the karvas aside and donate them to a near-by temple. 1) As I am planning to keep 1 Peetal and 1 Mitti karwa, so can I donate the mitti karwa and keep the petal karwa along ? 2) Also which karwa should be on Maa Parvati and which to be mine while exchange ? 3) After the noon Pooja can I touch my husband’s feet ? As no elder person is there in the house ? For the 1st fasting is it necessary to eat fruits after the Afternoon Puja ? Hi Rashmi, Your question is unclear. What do you mean by 1st fasting in this case? Please note that on the day of Karva Chauth you are not supposed to eat or drink anything till the evening ritual during which you will be worshiping the Moon. You can eat something before sunrise in the morning of Karva Chauth. Following that do all afternoon rituals etc. without eating or drinking anything till the evening. In the evening, after the ritual of looking at the moon you can break your fast as described above. Hi Rashmi, Thanks for your questions on Karva Chauth Vrat Vidhi. Answers below. 1) Yes. You can donate the mitti karwa and keep the peetal karwa with you. 2) This is again your choice, Rashmi. You can start with the peetal karwa placed towards Goddess Parvati so that after 7 exchanges, the karwa is on your side. Normally, if you were using two mitti karwas you would donate both but in this case just donate the rice and other items that are in the peetal karwa along with the entire mitti karwa. 3) Seeking blessings of elders after the afternoon pooja is optional as not everyone has older family members. If you are doing the pooja alone, just follow the remaining steps as listed above. Well explained article, thanks guys.. I am in Canada and I don’t have enough stuffs to buy here, so as per the article and comments I have cleared many doubts… only one thing, as you mentioned we can give bayna to our mom or any other married woman? Since my mother in law isn’t here, shall I wait for it to give it to her when I will meet her in future? what do you prefer, is it something you have to give on the same day or it can wait? Hi Naina, Thanks for your question regarding Karva Chauth. Yes, you can keep the Baya aside to give the items to your mother-in-law in the future – you will still have to donate any perishable items like food preparations or sweets on the same day to prevent them from spoiling. Do note that normally people prefer to give the items away on the same day but it is also a matter of individual choice given you are located in Canada. I will perform karvachauth alone. Can u please guide me that at the end while exchanging the karva then the karva with the janeu should be with me??? Hi Eishwarya, As you are doing Karwa Chauth alone, you should use two karvas and two janeus/moulis. So you have to tie a mouli around each karva and not just one of the two. Hope that answers your question. I have to donate both karvas with its janeu too??? Can you please suggest me,if a girl is on 4th day of her periods. Then she can do this all rituals..as this will b my first time…i want to perform with all the rituals. Hi Naina, You can do the fast like any other married woman. Periods are a very normal thing and you should not be worried about that. Do the fast and rituals with devotion and with a pure heart and Goddess Parvati will give you all you ask for and also forgive any mistakes you might make. Hope this answers your question. Hi. Recently there has been a mortality in the family. So can you tell me if i can keep this fast of karva chauth or not. I really want to do it. But the problem is that on the day of karvachauth there will be ten days of mortality prayers. What should i do? Will you suggest me to keep the fast or not? Hi Eishwarya, Answering your question below as well as providing some additional details for others in the community. 1) If you have had a death in the family within 10 days of Karva Chauth, then you can hold the fast BUT you should not do any of the pooja rituals throughout the day. All you need to do is consume Sargi in the morning, do the Karva Chauth fast without water and food through the day and in the evening just step outside, fold your hands before the moon, do a normal prayer and ask your husband to break your fast. Do not do any rituals like showing the diya to the moon or anything else. 2) If you have had a death in the family in the last 1 year but it has been more than 10 days since the unfortunate event, you should do all rituals of Karva Chauth alone at home. You should do all the pooja rituals as well unlike what is described in Case 1 above. Note that you should not take part in community or group celebrations with other women who are observing Karva Chauth as it is suggested to not take part in celebrations if there has been a recent death in the family. 3) If more than a year has passed since a death has occurred in your family, you can follow all the normal Karva Chauth rituals and do it alone or in a group depending on your convenience. Hi Eishwarya, Please observe Karva Chauth according to Point 1 above. Pasting here once again for your reference. Hi Pooja, Normally it is believed that once you start doing the fast, you should do it every following year unless you are facing any health issues or other problems that prevent you from holding the fast. For example – if you have to appear for an exam or have some other commitment that makes it tough for you to hold the fast this year, it is okay to skip it this time. In case, you decide to skip the fast, please refer to the comments & our responses above for details on what you should do in that case. can I perform the Karwachauth fast while on my 4th day of my periods..
Hi Rishali, Yes you can. However, if you are facing any health issues because of your periods and if you believe that doing the fast can cause further problems, you can skip the fast this year. Please refer to some of the comments & responses above for details on what you can do in case you decide to skip the fast due to health reasons. Hey i am doing karva chauth pooja alone… I have already bought two karvas…but i am on my periods… tomorrow is my 6 day of periods… can you please tell me can I do karva Pooja with karva calendar or not ? And I am little confused about karva exchange process as you said Maa Parvati karva should be on side of person who’s praying ? I am very confused about this can you please clear my confusion ? And also what should I do with water in both karvas? On the question regarding exchange of Karvas with Maa Parvati – As you are doing the pooja alone, you will be facing the image of Maa Parvati. You should place one Karva next to her image and one Karva next to yourself. From a ritual perspective, the first Karva belongs to Maa Parvati and the second one belongs to you. Now just exchange these Karvas as described in the Vrat Vidhi above. Hope that answers your question. hi! great informative article… ty .. me n my husband dont share the same caste n in my parents home we dont celebrate karva chauth but my husband s side we do so many thanks..i have one query though.. on the day of the fast latest by what time in the morning one can consume food n water..what exactly the term before sunrise means. if sun rises at 6.20 the daylight starts breaking around 6 or little before. i also read somewhere that one should start fast after offering water to sun..is it so.. ty soo much..
Hi Priya, This depends a lot on individual interpretations. Technically, you can consume food till the time of sunrise but normally women stop consuming food & water sometime before that just to be on the safer side. Hence, it is preferable to stop eating food or drinking water once daylight breaks which can be 10-20 minutes before sunrise. You should plan accordingly so that you have had enough food and water in time. To answer your second question – yes, some people do offer water to the sun but it is not necessary. It is sufficient to follow the steps that we have described above. As you can tell, there are hundreds of variations in the vrat vidhi and people often add steps based on their family traditions, beliefs and preferences. However, it is not necessary to execute that step. Its my wifes first vrat and her period has started from morning 10..
Now which vidhi is possible for her to do..
Hi Sahid, We had answered a similar question earlier in the comments. To repeat – your wife can keep the fast even during her periods unless she is facing any health issues because of the same. If she is facing health issues, she can skip the fast this year. Please refer to the earlier comments on this page for details of what she can do if that is the case. On the occasion of karwa chauth day, I did fasting. Due to weather condition I could not see moon and also, I waited for 30mins and I had my dinner. I bit worried on having food without seeing moon and I hope there isnt anything to woory. Please do reply on this . Hi Sushila, It is ok if you were unable to see the moon due to weather conditions. You already followed a lot of the tougher rituals during the day so there is no reason to worry. Hi. You said that after the pooja (moon ritual)then offer mother in law the plate. What do you mean by that? hi! i need your help pl. i have had some relationship problem n my husband is with some other woman now. i wish to discontinue keeping the fast or atleast have a choice to keep or not.. can u pl tell me how to do it.. many thanks..
VedSutra © 2019. All Rights Reserved.